Sapzurro is in Colombia, about roughly a quarter of the way from Capurganá in Colombia to Puerto Obaldia in Panama, and across the international boundary from Panamanian town of La Miel. You can walk from Capurgana to Sapzurro, it takes about one hour and a half over the mountain with plenty of views. At least in August the walk is very sweaty so take off unnecessary tshirts already at the beginning. You can fly from Medellin to Capurgana with ADA . This service was suspended in 2014, so check on the ADA website or with a travel agency for its current status. An alternative is to fly from Medellin to Acandí with ADA and then take the boat to Capurganá/Sapzurro. From Turbo you can take a launch from the Waffe (Wharf) that leaves at around 7:30 am to Capurgana which costs 55000 COP. The trip takes 2.5 hours approx. The sea can be a bit rough between December and February so its more enjoyable to get seats at the back of the boat. Also have sun protection with you. Its also a good idea to take something to drink and a snack. To avoid getting your belongings wet you should put them inside a bin liner, which they conveniently sell at the dock for an outrageous price 1000 COP. They charge an excess baggage fee of 600 pesos per kg exceeding 10kg. From Capurgana you can take a launch to Sapzurro for 7,000 COP, most boats leave at 12 noon although you can get boats as late as 5pm (but dont rely on it). From Puerto Obaldia, Panama it's a 35-45min 15 USD launch ride. A number of sailboats also run between Panama and Sapzurro, especially between November and April when the trade winds make the Panama - Cartagena trip untenable. The Darien Gapster  also makes this trip. See the section for more info. You can arrange a launch in the morning to Puerto Obaldia (30,000 COP) and catch a flight to Panama City. Air Panama operates one flight on Sundays, Tuesdays, and Thursdays departing at 9:30am arriving 10:40am  bookings should be made by phone as they don't always check the email or website. Please see the [Puerto Obaldia] page for more details. The Darien Gapster runs between Sapzurro and Porvenir/Carti, San Blas. It includes a three day tour of the islands. A number of sailboats have now made Sapzurro their home as well. They have chosen the Sapzurro - Porvenir, San Blas route over the Cartagena - Porvenir route for a gentler ride while seeing more of San Blas. These trips include three full days in islands meals included at $300-$350. Talk to the Chileno at Paraiso Sapzurro for scheduling launches and sailboats. +57 313-685-9862 Spanish speaking. There are no roads in Sapzurro, so your options to get around are to walk or go by boat, but thats not really a problem as you can get from one end of the village to the other in 10 minutes. You can go on a jungle trek to Capurgana an hour and a half walk over the mountain. The Diana Waterfall is nice especially if has rained recently. There is a half an hour walk along the coast to Cabo Tiburon - Shark Cape, the coastal border between South and Central America. There are many coral reefs in the Sapzurro Bay and along the coast to Cabo Tiburon ranging from 2m deep to 40m, you can snorkel or go freediving, mask and snorkels can be rented. Where the jungle meets the sea. Hiking, swimming, snorkling, waterfall, exotic birds, and monkeys. Sapzurro has plenty to offer, from simply relaxing on the beach or on the seafront, to a wide range of outdoor activities. In particular, it is a naturalist's paradise, with tropical forests and coral reefs competing for your attention. Twice a year the village is graced by the spectacle of thousands of migrating hawks and vultures, an amazing natural event that is only just capturing the attention of birdwatchers. Hiking - A number of routes can be taken from Sapzurro. Sapzurro to Capurganá - The most popular hike is the trail between Sapzurro and Capurganá, which heads south from the village along the waterfront before heading inland and up and over a hill that takes you up to around 200 masl. Much of the walk is through forest and the trail can get muddy in wet season. The walk can take anything between an hour to two and half hours depending on how distracted you get along the way. Cerro Parado - This is a fairly tough hike and should not be attempted without a local guide. The walk takes you up to the highest peak behind Sapzurro and through some stunning forest. The trail is not at all well marked and as part of it runs along the international border, it is not advisable to undertake it without the company of someone from Sapzurro. Guides can be contacted through Martha and Fabio at the Reserva Tacarcuna or ask around for Digno, Beunder or Roberto, who have all received basic guide training (Spanish speaking). 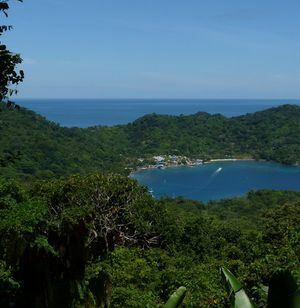 La Miel - This short walk offers some great views from the border post and ends at a picturesque beach in Panama. Make sure you take your ID card or passport, as you will need to present it at the border post. Cascada la Diana - This short flat walk, starting from the southern end of the bay, takes you to a small waterfall known as La Diana. The waterfall tends to dry up without rain, so it is best visited during the rainy season or following thunderstorms. There is a small pool at the base of the waterfall if you need a break from the heat and humidity. Snorkeling - There are some good spots for snorkeling in the semi-circular bay where Sapzurro is located. Between December and March, the sea can be rough and visibility low. The best time of year for either diving or snorkeling, according to the locals, is October, when visibility can be excellent. The reefs in front of "El Chileno" to the south of the village are recommended. Although not actually in Sapzurro, the snorkeling from La Miel is also worthwhile, particularly the reef that fringes the right-hand (western) side of the bay. Snorkels are now available for hire at La Miel. Birdwatching and general wildlife - The Darién is a meeting point for the wildlife of Central and South America and real a hotspot for biodiversity. Over three hundred species can be seen in the wider region and from Sapzurro a wide range of species can be found including Chestnut-mandibled and Keel-billed Toucans, multiple species of Trogons and Hummingbirds, and specialties like the Rufous-vented Ground-Cuckoo and Sapphire-throated Hummingbird. The migration of hundreds of thousands of hawks and vultures between mid-October and the end of November is a spectacle not to be missed. Monkeys are a popular attraction as well, with several groups of Howler monkeys present, while the Geoffroy's Tamarin often ventures into the gardens of the accommodations on the edge of the forest. If wildlife watching is your thing, then check out the information at FaunaDarién. Guides for wildlife watching can be contacted through Martha and Fabio at the Reserva Tacarcuna or ask around for Digno, Beunder or Roberto, who have all received basic guide training (Spanish speaking). You should take into account that there are no ATMs in Sapzurro or the surrounding region (however, cash advances are now possible in Capurganá, although they may not function for all credit/debit cards), and no businesses in Sapzurro currently receive credit cards, so you should bring enough cash preferably in COP or USD with you. The exchange rate is variable but expect to receive between 1700 and 2400 COP for USD. At the Club de Yates (Yacht Club) you can buy Molas, a cloth sewn with intricate designs by the Kuna Yala tribe in Panama and/or a T shirt to take back to the folks back home. They also sell beach articles. You should check out the local ginger, borojo and hibiscus wines sold in the Club de Yates and some restaurants and bars in Sapzurro. There is a local bakery run by Andres and Eloisa, ask for directions. A photographic guide to the local wildlife (in Spanish) is available from the local guides such as Digno, Beunder and Roberto, or ask at the Tacarcuna reserve. If you are in the mood for some delicious home made brownies or a refreshing lemon cake, contact Clemencia in the Zingara Hostal. Shops start to close from 7 pm onwards so if you need to buy provisions take that into account. The most common dish in the restaurants in Sapzurro is fried red snapper, rice made with coconut milk and fried plantain. If you are looking for something different there is a Peruvian Restaurant "Paraiso cangrejales" where you can eat Ceviche de Pescado (raw fish in lemon juice), Fish in Mango Sauce, Chorillana and Chicharron de Pescado (fish steaks). Also the Posada serves great seafood dishes with shrimps, squid and fish. For a lighter dish there is a Pizza "Hut" (it really is a hut! - not related to the pizza chain). There is a restaurant-pizzeria driven by a German guy at the beach 70m or so south of the docks, it's large-ish and you can't miss it. The place has WiFi - surfing and VoIP works quite well even if there may be some delays - though it's not included in meals but at a separate charge of 2,000 COP for an hour, which may well be worth it if your hostel does not have WiFi. There are several bars along the seafront but perhaps the best option is buy some beers from any one of the shops in the village and pick your favorite spot on the seafront to drink them. Imported wines and spirits can be surprisingly cheap, due to the availability of duty free goods from neighboring Panama. There's lots of place to stay both within the village and along the beach to the south. The accommodation options rarely fill up but be aware that in late December and early January, and during "Semana Santa" in early April, things can get busy. NOTE: On various days (not always weekends) there is VERY LOUD music on the waterfront, so the farther away from the bay you are the better, if you are light sleeper. While the area was subject to smuggling and banditry in the past, it has been fairly safe for a number of years now and guerilla movement of FARC was driven out of area over ten years ago. It's quite safe to walk between surrounding towns and Sapzurro. The tap water is not treated, so you should either drink bottled water or filtered water. At some times of day there are mosquitoes so bring insect repellent and for jungle treks long sleeved shirts and long trousers to protect yourself. Bring a torch with you as the electricity in Sapzurro and the surrounding region is not available 24 hours a day. You can purchase a SIM card (see below), suitable for video calls to your friends and family back home. There is no postal service in the region, however you can send articles by air freight to and from Capurgana-Medellín. You can make national phone calls from the super giro lottery and pay for the time used. Phone/WiFi: Take into account that Comcel is the only mobile phone operator with coverage in Sapzurro. You can purchase a SIM card at the Kiosk by the water front. Cell Phone and Data service can be paid for there. Currently there is 3G service in Sapzurro. You can get 1.5MB/second throughput when using this i.e. excellent. To travel by boat to Turbo you need to take one of the boats leaving Sapzurro at 6:30am which gets you to Capurgana in time to catch the boat to Turbo that leaves around 7:30 am. You can fly with ADA  from Capurgana to Medellín (Olaya Herrera airport), reserve with plenty of time. The day you will be leaving get a boat from Sapzurro to Capurgana at 10am (check the day before for availability), you should be at the airport by 11 am. This page was last edited on 3 September 2016, at 14:10.